Children's entertainment troupe The Wiggles have ousted Nicole Kidman from the top of an Australian rich list. The musical foursome, who are seen on TV around the world, made A$45m (£18.4m) in 2004 from the sale of CDs, videos and other merchandise. Kidman dropped off the top of BRW magazine's celebrity chart despite almost doubling her earnings in the past year to A$40m (£16.3m). Russell Crowe was third with an estimated A$27m (£11m). 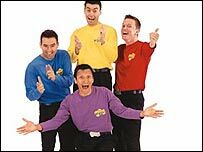 The Wiggles have captured the Australian market for children's educational entertainment in the last 10 years and have made inroads in the US and UK. Their show is on the Disney Channel in the US, where they kicked off a national tour on Wednesday. The group can also be seen on Nick Jr in the UK and are due to tour there in July. They have also made several Wiggles movies featuring their characters such as Dorothy the Dinosaur, Wally the Magician and Mrs Bingle. BRW managing editor Tony Featherstone said The Wiggles' success was down to a great product and marketing. "They got into the market early, they took time to understand their audience, not only children, but the parents who pay for everything," he said. Rockers AC/DC amassed A$18m (£7.3m) from a comeback tour to reach fourth in the list. Actress Naomi Watts was fifth with A$17m (£6.9m) having starred in blockbusters including The Ring and Ned Kelly. Another children's entertainment group, Hi-5, who are aimed at toddlers, were sixth with $15m (£6.1m). Singer Kylie Minogue was in 14th place with A$6m (£2.5m).